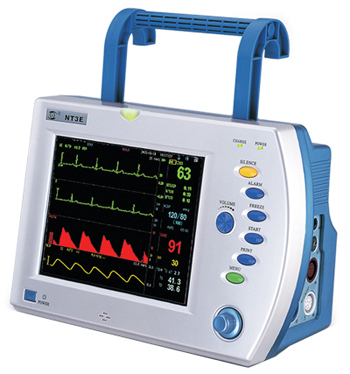 NT3B Multparameter Patient Monitor,12.1" High Brightness TFT LCD,1-8 Channel Waveform Display,•7 Channel ECG Waveform Display; ST Segment Analysis; Arrhythmia Analysis,Anti-movement and low perfusion SpO2 Measurement,Defibrillation and ESU Protection. NT3C Multparameter Patient Monitor,10.4" High Brightness TFT LCD,1-8 Channel Waveform Display,7 Channel ECG Waveform Display; ST SegmentAnalysis; Arrhythmia Analysis,Anti-movement and low perfusion SpO2 Measurement. NT3F Multparameter Patient Monitor,6.4" High Brightness TFT LCD,1-8 Channel Waveform Display, 7 Channel ECG Waveform Display; ST Segment Analysis; Arrhythmia Analysis ,Anti-movement and low perfusion SpO2 Measurement,Pace Pulse Detection,Defibrillation and ESU Protection.